This is my SALT contribution this week. Such a wonderful verse to remind us of the goodness of God. We often have to think of things that are not nice, difficult and challenging in our every day lives, finding a way through that is God honouring. This verse helps me to focus on the goodness of God and his creation. 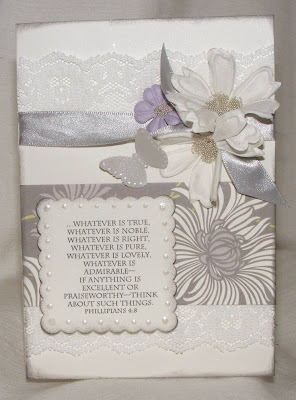 PP by Laura Ashley, Prima flowers, Martha Stewart butterfly stamp, Pebeo pearl touch, ribbon and lace from stash. Had a go at this week's sketch from CPS, I love that site! Been thinking about what craft items I am really into at the moment, thought I'd make a list. I'd love to know what you're obsessed by too, please post on your blog, let me know and I'll come and visit and see if I can pick up a new obsession! Dimension - the more the better! My cards are going to be thick as they are wide if I keep going to far! Pink and Green - Just love that combo. Pearly pins - been using loads ever since I bought some on ebay for wedding corsages. Buttons - with a thread or ribbon through, I really don't like them looking naked, its just not right! Martha Stewart butterfly punch - managed to find one, again off that auction site! Anyway, back to the card, here it is. 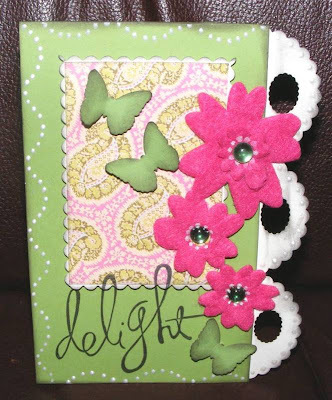 PP by Kand Co, felt flowers by Junction18, stamp by Heidi Swapp, butterfly punch by Martha Stewart. Scallop circle and small scallop oval punch, gems and Pebeo pearl touch. They are such a versatile crafting tool. Such good value for money, one punch = millions of punchies. I have amassed a fair collection over the years, but my favourites are the flower, leaves and winged things (butterflies and dragonflies). 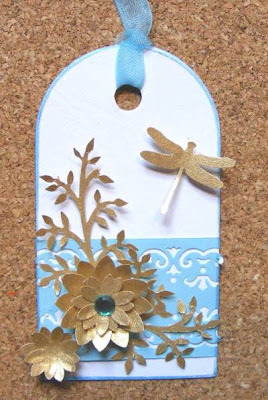 So, I was very pleased to see the tag challenge this week, check it out here. Punches used: X cut, EK success, Leone Em and Anna Griffin. 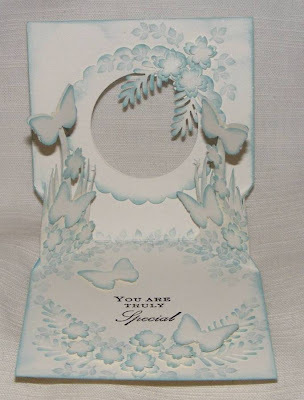 PP by unknown, flower by Prima, sentiment by Brenda Walton, butterfly punch by Martha Stewart. Lace and brad from stash. Pebeo Pearl Touch. We all went off to Sheffield for a few days to visit a friend of ours. 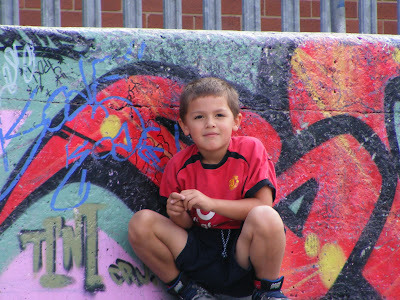 Went to a fab museum that was extremely child orientated, lots for them to do and . Tom discovered another bookshop! My friend took these pics with my camera, I just love them! Luke looks so handsome and grownup. 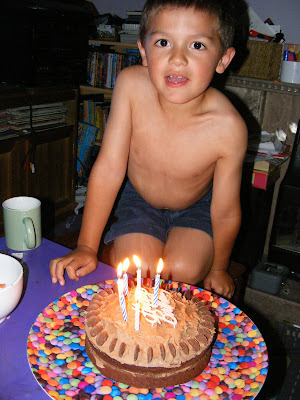 He was 6 yesterday! I am so honoured, there are so many people I could pass this on to, I know its a bit of a cop-out, but if you're on my list of links consider it yours. A village near us was having their annual show. A friend of Luke's was to be an attendant on the carnival queen's float and asked Luke to accompany him. I was encouraged to dress up and got a prize! I entered four cards and two floral art categories. Got second prize for my card and third for one of the floral displays. A grand total of £8 won today! When I knew I wanted to enter the card section of the show I had thought of doing a pop card. I saw this technique last week and thought I'd try it out. 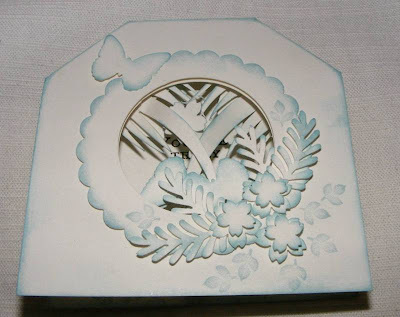 I had bought the Martha Stewart Clasic Butterfly punch and was itching to use it. 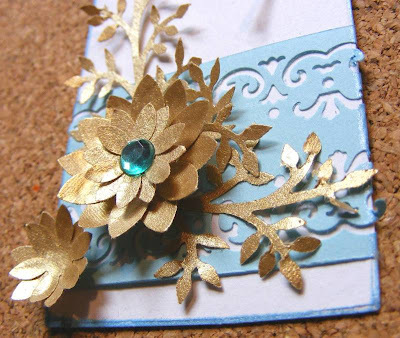 Only one type of cardstock was used throughout with lots of layering of flowers and leaves. Ingredients: Punches by Martha Stewart, Punch Bunch, Dove craft and Carl Craft. Fiskars shape cutter for circles. Leaf stamp by Rubber Stamp Tapestry, sentiment stamp by Anna Griffin. 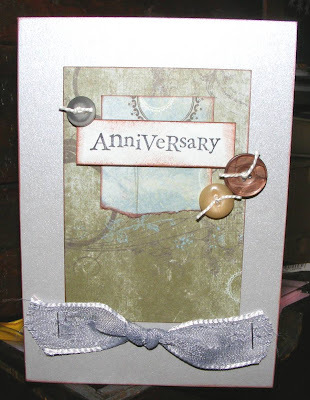 Thanks for your comments, please let me know if you'd be interested in me doing a tutorial on this card. Wow, what a thought provoking challenge Kim gave us this week, pleae check it out here. 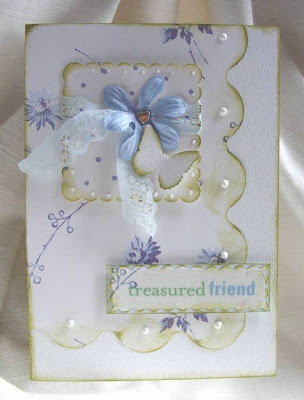 Here is my piece... yes i know it looks a bit like my last one, I'm really into these stamps at the moment! 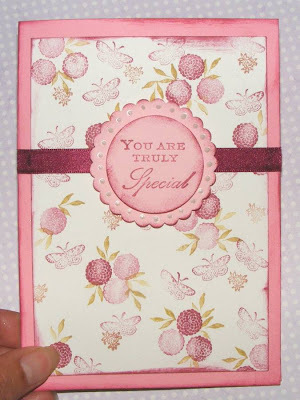 Ingredients: Stamps by Laura Ashley and All Night media. Pebeo pearl touch, scallop circle punch. 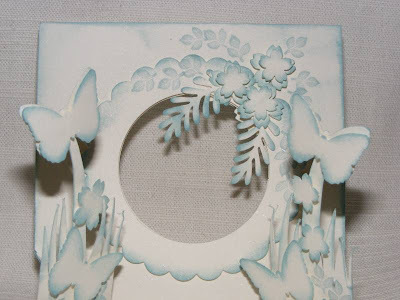 Recently bought the Laura Ashley peg stamps, they are fab. The 4x4 challenge this week was a great excuse to use them. Stamps by Laura Ashley, Runner Stamp Tapestry, Anna Griffin and All Night Media. 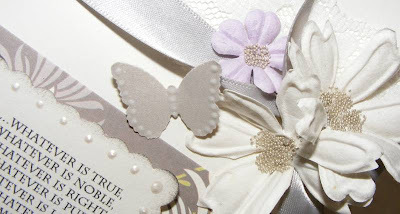 Pebeo pearl touch and ribbon. 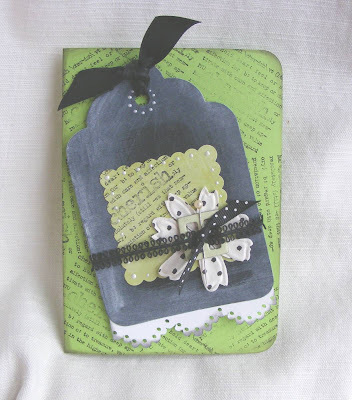 Inspired with the Teal, Lime and Black theme this week from Tag you're it! I sort of misread it, and have not included teal in my creation. Really pleased how it turned out. 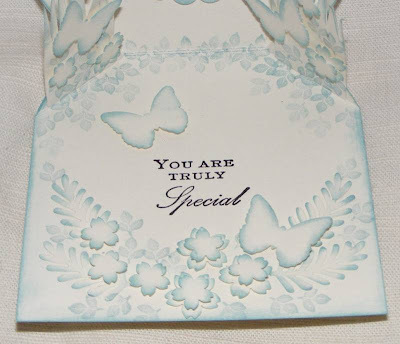 Ingredients: Stamp by Stampin Up!, Prima flower, TLC chip buckle, Pebeo pearl touch, ribbopn, pin and tag from stash, scallop edge done on Craft Robo. Sorry I've been away a while, was on holiday last week, and its taking a few days to recover! 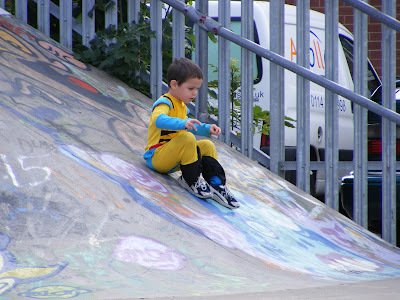 Had a fabulous time, and even took some craft stuff which attracted all ages to get punching and sticking! This card is for a regular customer of mine, and based on the 2sketches4you sketch this week. Ingredients: PP by Basic Grey, stamp by Inkadinkado and ribbon, buttons and string from stash. 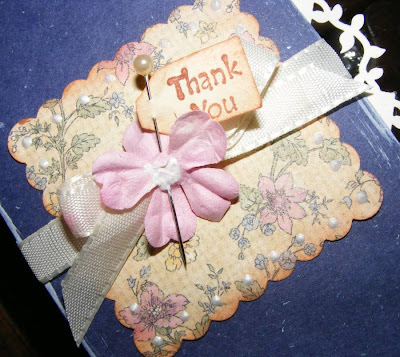 Just a thank you card. Discovered I could take the corner guards out of a favourite punch to make a border punch! 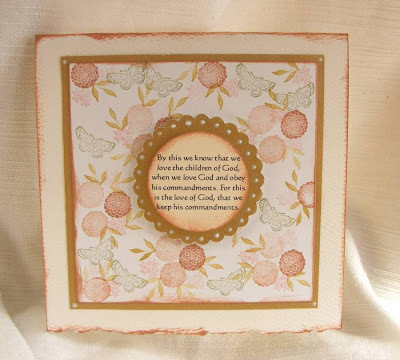 Indredients: PP by HOTP, stamp by Hero Arts, Prima flower, corner, tag and scallop square punch, Pebeo pearl touch, and Adirondak paint dauber, pin and ribbon from stash.